Morwhenna. 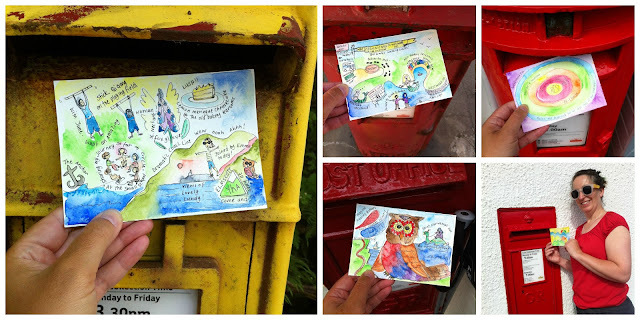 The Creative Adventurer: Fancy a postcard from a Creative Island Adventure? Fancy a postcard from a Creative Island Adventure? I’m starting my UK Islands Project in January and as part of this I’ll be creating unique art postcards inspired by each Island I visit. If you're thinking - ooh I'd like to be a part of this some how, here's one way to be involved - you can receive your very own unique 'Art Postcard from an Island Pilgrim' if you'd like to! I’ll be searching out Island Magic and exploring how these islands have inspired various creatives - from literature, music, art to the characters that live on the Islands today. You can read about the full adventure here. A lot of the islands that I’ll be visiting have their own postage stamps which I think adds an extra element to each art postcard. You’ll be getting something completely unique created by me and posted directly to you. You can be a 'Postcard from an Island Pilgrim' sponsor for the princely sum of £13. This includes postage (worldwide) and paypal fees. Each postcard will be completely unique and will capture the spirit of the Island I’m on at that moment. You can either choose which Island you’d like to receive a postcard from (please specify in the text box) or can leave it up to me to decide. If for any reason (e.g the weather) I'm unable to visit a particular island in the month I’m due to go, I’ll send your card as soon as I’m able to visit and stay on your chosen Island! Do check back for updates as I fill in the TBC gaps. January - Isle of Portland - Tick! February - Isle of Sheppey (via the Tate) - Tick! March - St. Agnes (Southernmost settlement of the UK) - Tick! April - Lundy - Tick! May - Skomer - Tick! June - Avalon - Tick! July - Anglesey & Skokholm - Tick! August - Bardsey - Tick! September - Looe - Tick! October - Jersey & Kirrin Island - Tick! Please make sure you specify which Island you’d like to receive your special postcard from. If the box is left blank I’ll send you one at random. You can choose to have the Artwork sent to yourself or a friend anywhere in the world – please be clear in the notes section and please make sure I have the complete address. The postcards are made of strong watercolour card and the materials used could vary from watercolour, pencil, ink to pen. Your postcard will be sent as a Postcard so it will be franked by the post office and will go on its own journey to reach you. The image shown at the top is an example of the postcards I created on my B2M adventure in 2015 to give you an inkling of what kind of thing might end up in your letterbox! As with my B2M trip this is a self-funded expedition. As well as running creative courses, coaching and creating artwork I work part-time for the charity Creativity Works. I am being supported by Great Art who are supplying my arts materials and Pulsin who will be supplying me with their healthy treats! In fact I was pretty much ‘Powered by Pulsin’ for the first few days of my trip last year as I’d misjudged the food options available on route i.e none! So their bars kept me going!! Very happy to talk to you if you have any questions! p.s if you'd like to be involved some other way, have some ideas about which islands I really must visit, or live on one of the islands I'll be visiting - drop me a line! I'd love to hear from you.